The good news is YES. 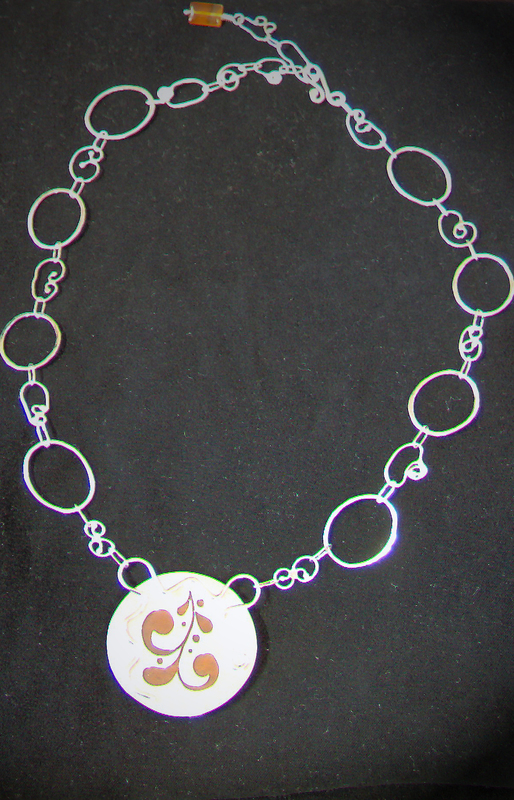 New Jan Mac Jewelry will be in-store this week. Finally. Between getting it made, getting the logo and packaging ready, and just getting it there, this has been a long process, but it’s been worth it. The first batch will be in by the end of the week and I plan on building pretty steadily for the next 3 weeks. I’ll show and tell as things are finished. So check out the display in the Cara Luna Jewelry section of the Cresteramics storefront, between Mawson’s Sports and Morris Flowers. Hopefully you’ll find something that will simply delight you. There are many creative processes that result in a finished product that is much more than merely the sum of its parts. With painting, while there is unlimited potential in each blank canvas, layers of gesso, paints, texture medium, varnish, bits of paper, sparkly sequins, twisty bits of thread, chunks of cut-up eraser…anything really… can result in full-blown masterpieces. How someone can envision so much in paper sample-books and bits of text is a mystery best unraveled by those with more skill than me. As with anything else I advocate, painting is another area where I encourage you to Just Make a Mess. You simply cannot paint your opus with the paint in its tubes, your brushes still pristine, and that canvas sitting there blankly withholding all of its potential. The same can be said of cooking, which some consider a chore but I consider an intricately creative process. When asparagus in the grocery store starts whispering “Pssst….Hollandaise” as you walk past it, you know you need fresh eggs, that the butter you usually deny your husband (I know, I’m a meanie) is going to end up in the cart after all, and that you can already smell the zing of those luscious lemons. I just dare you to have a spotless kitchen after making Hollandaise. 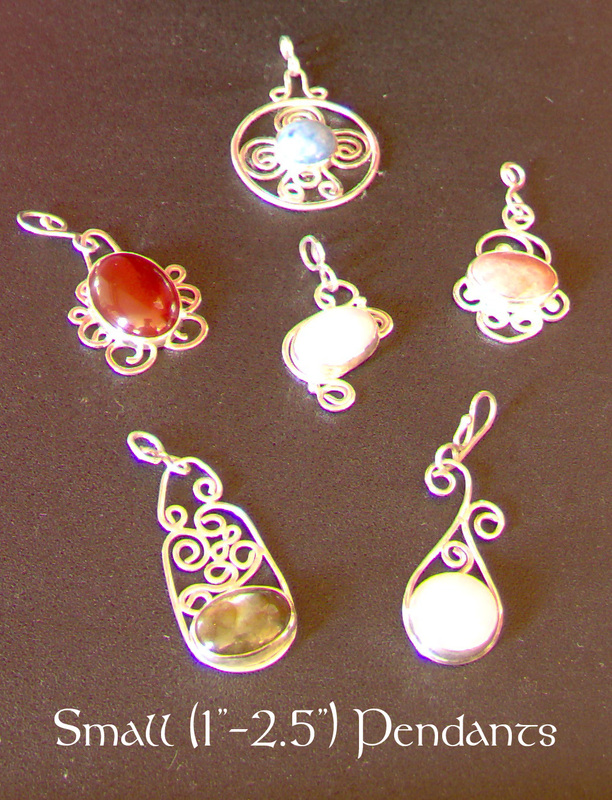 Jewelry design and manufacture is certainly all about taking quality raw materials and fiddling about with them until you have all of the little bits that will end up being something (we hope) extraordinary. Something that, even if it’s not to everyone’s taste, at least makes the majority of those who see it go “Wow”. 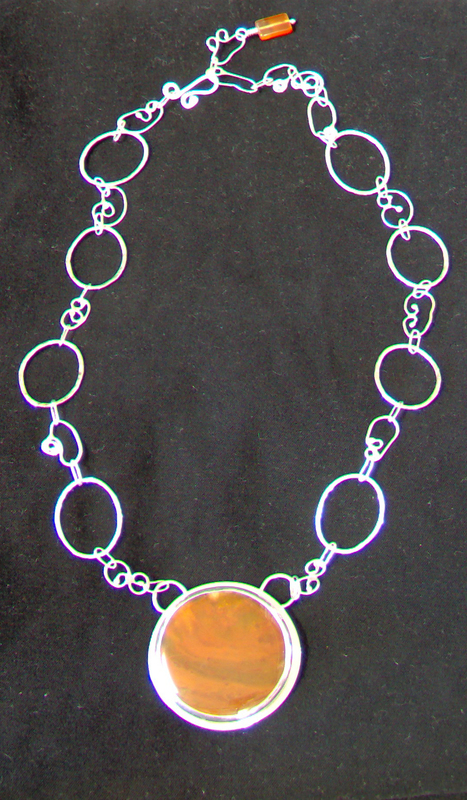 You have all so kindly followed along as I plodded through the creation of this large Jasper necklace. To be frank, it was one of those projects that sort of morphed and changed in a very organic way throughout the process. I like how it turned out. The photos don’t show the detail of the cut-out side, but I’ll get on making that light-box this week to improve the shot and will re-post then. I just can’t wait for that….I’m too happy it’s done. What do you think? Is it a “Wow”? 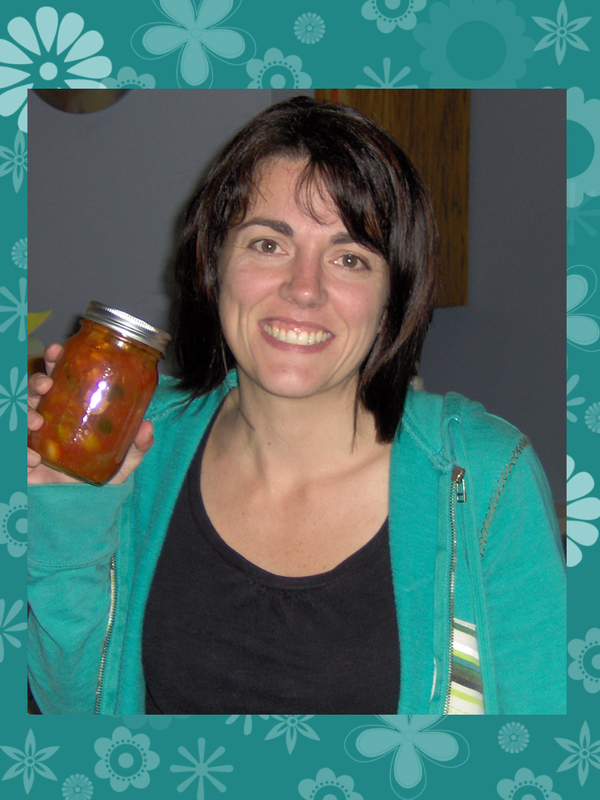 Have you ever had a project that just seemed to take forever to finish? That’s what this project has turned into. It’s actually driving me nuts as I’m really into the instant-gratification thing right now with my jewelry and like it much better when things just come together the way they’re supposed to with seemingly little effort from me. Almost like I’m channeling something and my muse is acting of its own accord. That’s SO not happening with this one. Things are moving along, true, but slowly…agonizingly slowly. It’s not really for lack of effort, but more because of life intervening. People stopping by, errands and chores, but I’m trying to do a little bit each day. I’m finally at the point where I can do a final fit-check for the stone and will do a final polish before setting the stone. 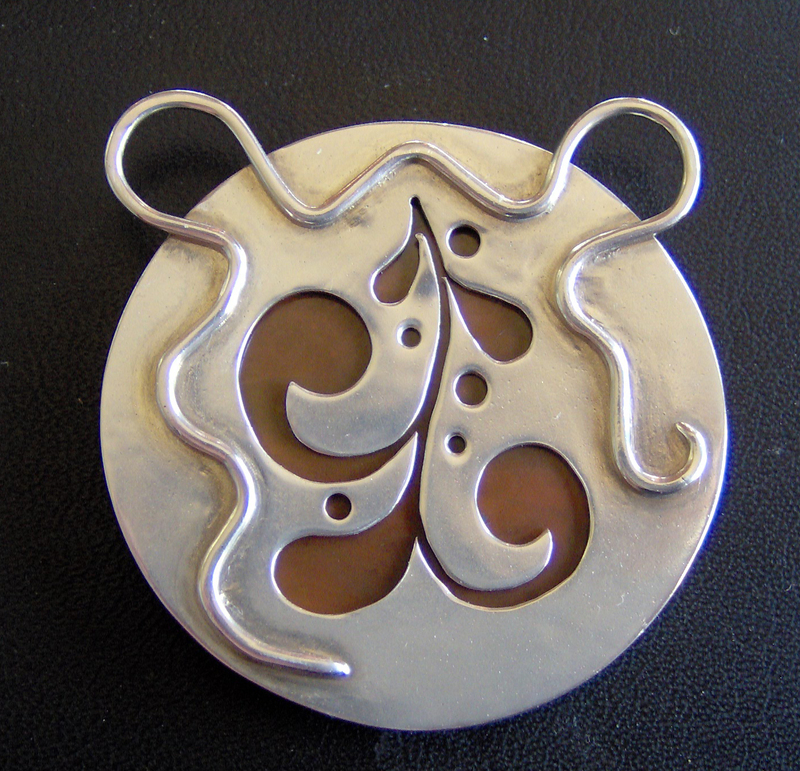 The chain will be hand-wrought and curly….distinctive and bold. There’s that word again. I’m liking it. The hard part now is going to be deciding which side of this is truly the front and which side is the back. I don’t think I can decide…I really don’t. Brandy is my amazingly supportive friend who is a successful artist, great mom, innovative business-owner, and fledgling musician. She writes the blog “Brandy Ink”, which can be found at http://brandyink.typepad.com; definitely check it out. Her blog was the inspiration for mine and I love that she won my contest. I would also like to thank her for wearing a shirt that blends so nicely with the colour-scheme of my blog, even though she didn’t know I was going to show up armed with a camera. 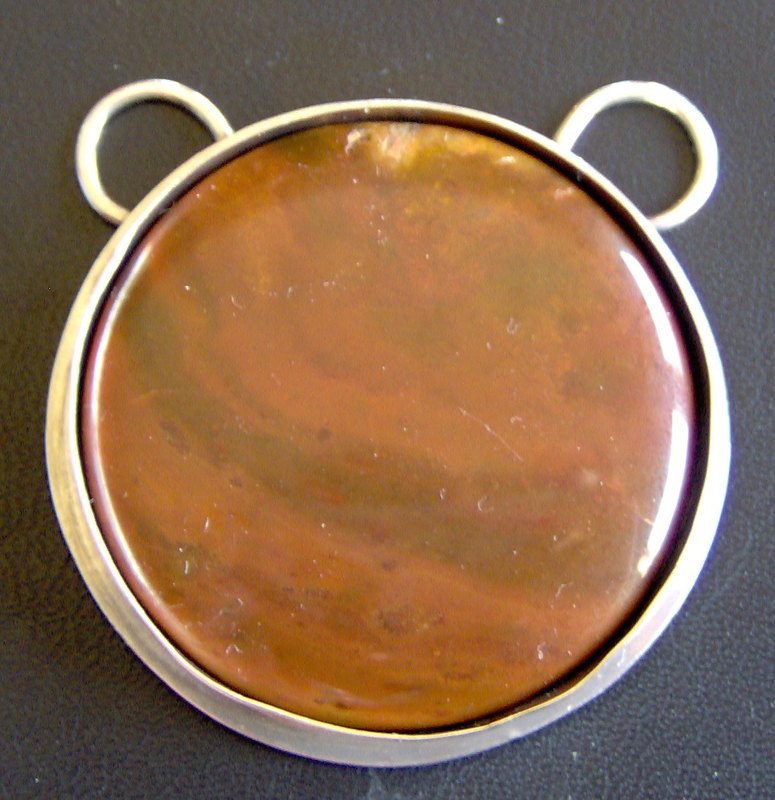 And now for something completely different…here’s an update on the Jasper necklace. I want the piece to be stunning from the back as well as the front. I love things that are reversible…it’s like you get 2 for the price of 1 and gives you 2 totally different looks to choose from. Large designer pieces can be a bit spendy so any time I can get, or give, more bang for a buck, I try to do so. I’ve filed the edges round the bezel setting and now want to cut a design into the backing plate to create some visual interest. The easiest way to transfer a design for cutting is to draw it out on paper (I just used a post-it note) and then glue it in place with a glue stick. The glue-stick glue allows you to reposition the paper for a while then dries quite hard. 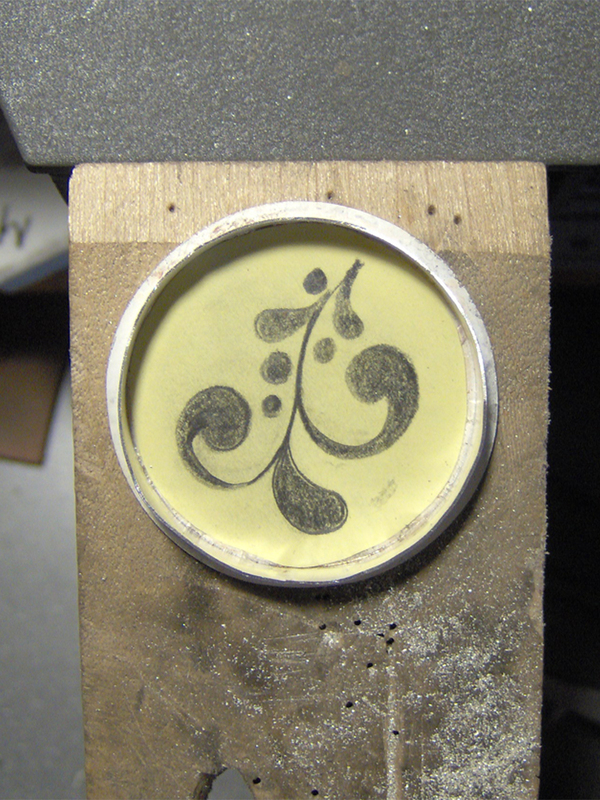 I’m going to drill a pilot-hole into the black area and use a jeweler’s saw to cut out the design. Once the design is cut out, a soak in the ultra-sound will remove the paper and I will use jeweler’s files to smooth any rough edges of the cut-out. Then it’s into the tumbler for a couple hours to polish and it’s on to building the bail. See you tomorrow, same time, same place. 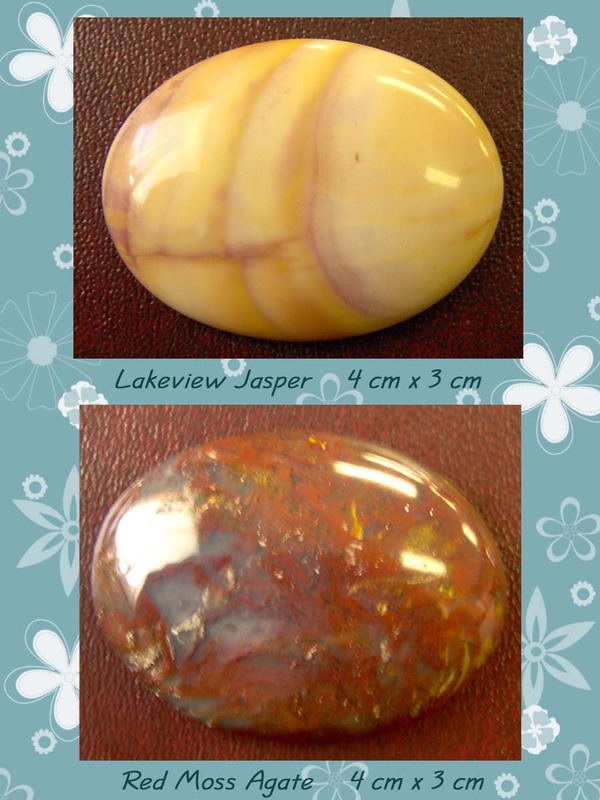 Jasper and Agate and Bloodstone, Oh My! 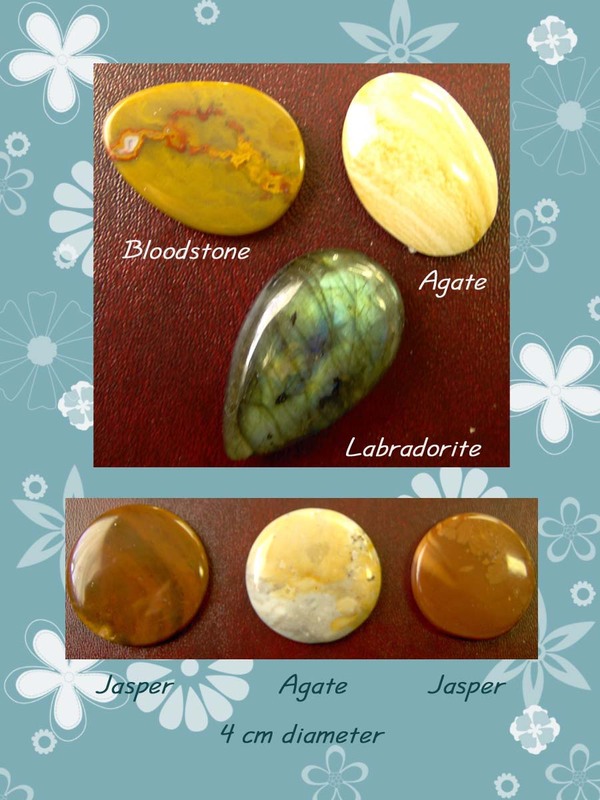 Nothing, absolutely nothing, is more likely to spur me into building jewelry than a bunch of new cabochon stones. Don’t get me wrong…I like a nice faceted stone as much as the next girl….sparkly is always good. 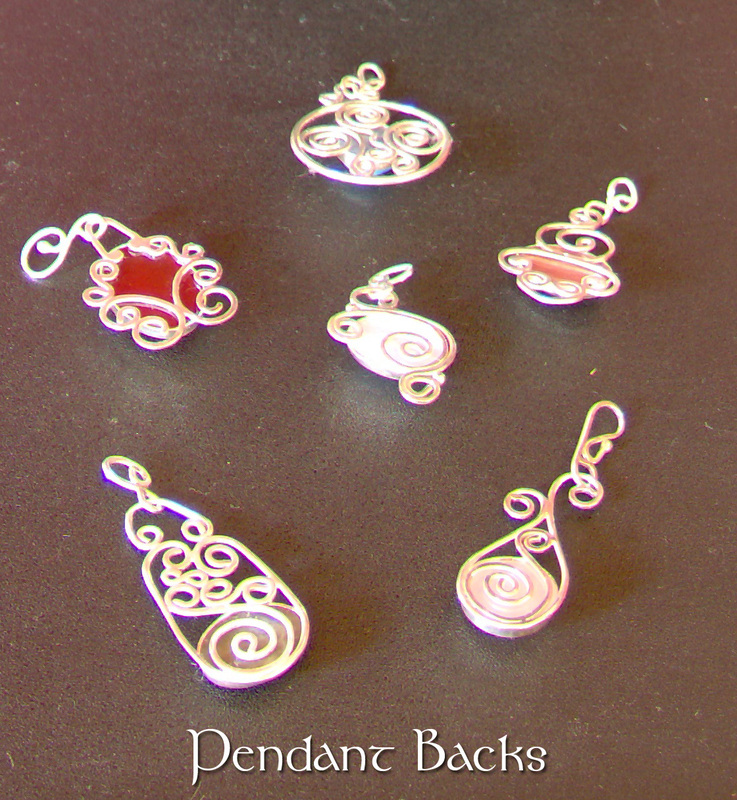 But cabochons, with their smooth tops and curvy edges, are so touchable, so silky-smooth, so….so….buttery. They are just pure inspiration. I actually hadn’t planned on buying these. I had gone into Beadazzled to check and see if my new polishing machine was in. It wasn’t, but these were. We’re so lucky to have a store like this in such a small town. I think specialty stores, especially artsy specialty stores, keep communities healthy. 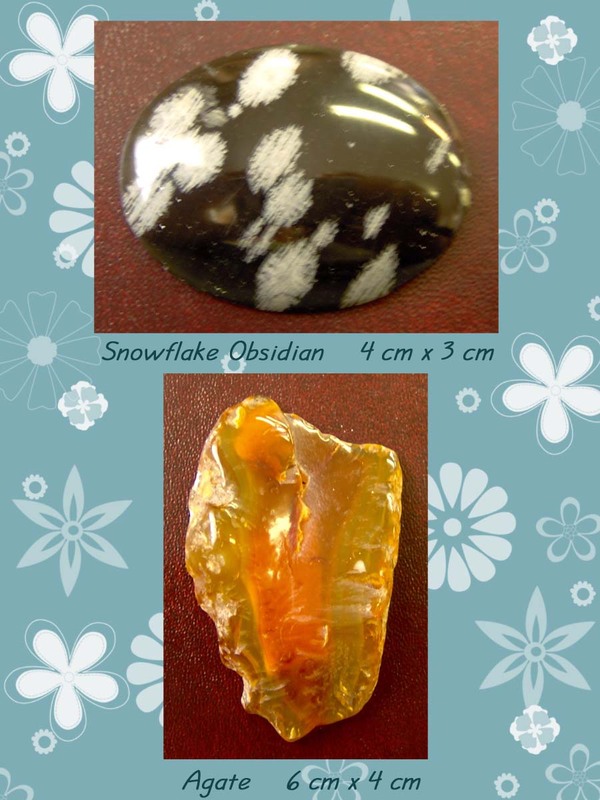 They provide places where you can go for inspiration, maybe take a class (as you can at Beadazzled), and ask the questions that have always sat unanswered. They’re places you can go and get what you need when you need it so you aren’t stymied in your artistic endeavors by the lack of a critical tool or supply.